I’ve had these jeans for about 4 years now. Not sure why I bought them as they are made for a 6ft supermodel! I would wear them with the most ridiculous turn ups or not such huge turn ups and have them drag on the ground. 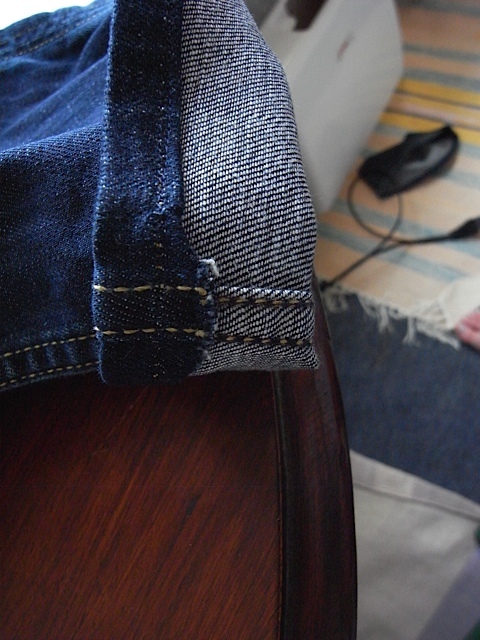 So when I started sewing, I thought, finally I might be able to shorten my jeans. Then I got carried away learning new things and forgot all about them. Then I remembered them but got scared. Those inside leg seams are very thick. 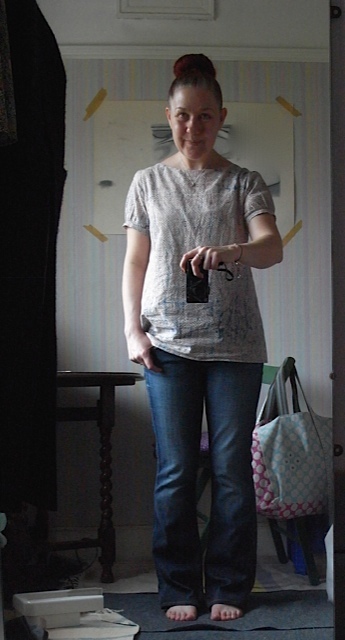 Then I read Matt Chapple’s (winner of the GBSB 3) blog post on shortening jeans and was convinced to give it a go. He made it sound so easy. 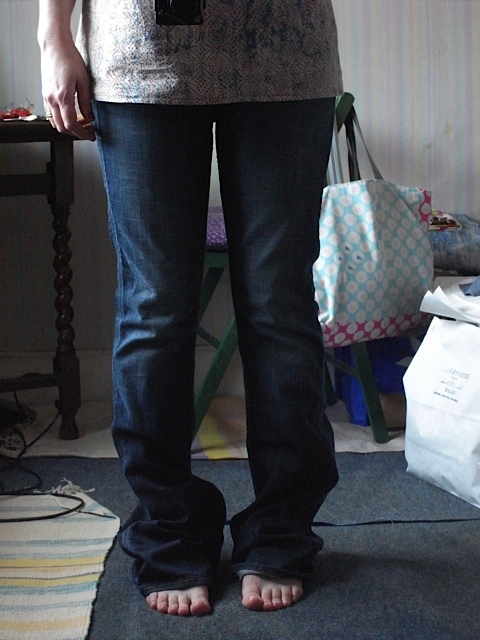 I haven’t worn these jeans much for the last of couple of years, so to be able to shorten them and make more wearable has been so satisfying. 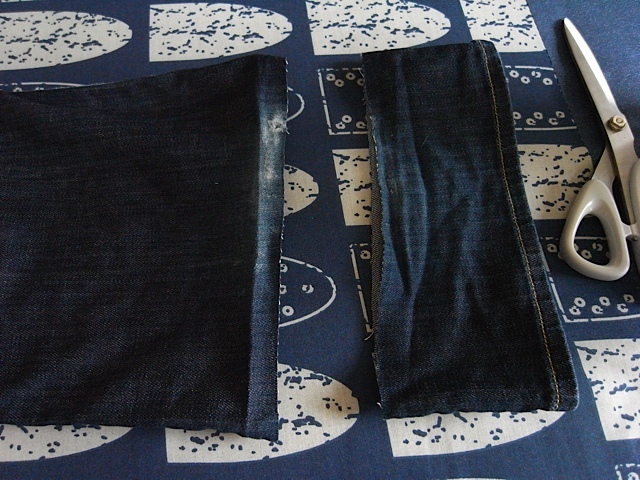 I think I cut off about 10cm and then turned them up about another 1.5 cm. I was trying to avoid turning the hem over twice as I was concerned about the thickness of the fabric and getting it through the machine. 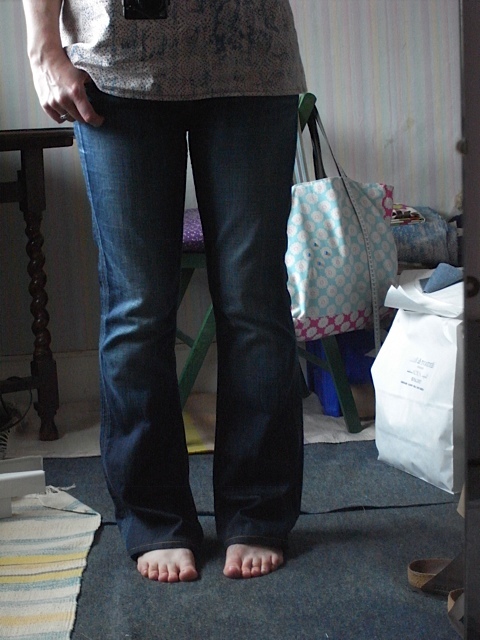 So I started off by zigzagging the raw edge, but realised this wasn’t going to look right so I had to turn the ends of the fabric over, could only afford to do it a little bit (or else the jeans would be too short). 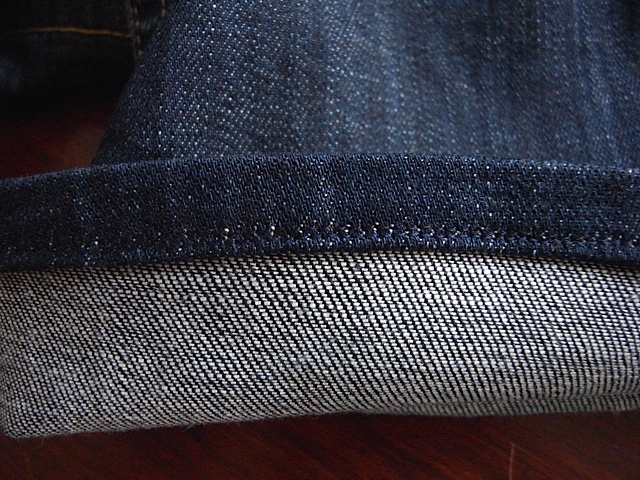 I bought denim needles for the machine as I thought it best, because of the thickness of fabric. I also bought some topstitch thread in the best colour match I could find. Which turned out quite well. The side seams have ended up a bit messy, but they won’t be seen. 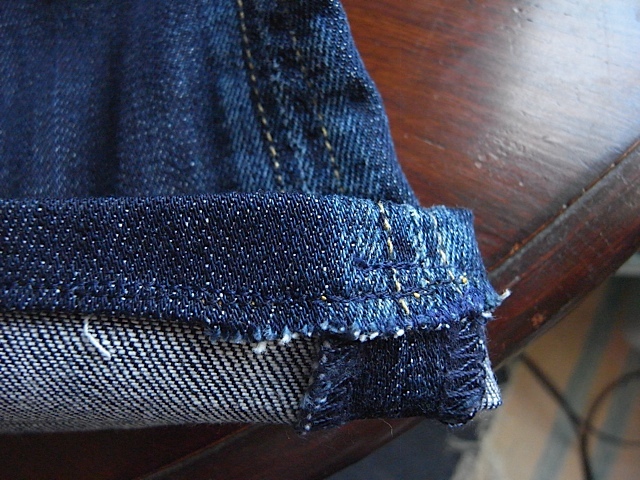 The inside leg seam, I did struggle a bit to get it through the sewing machine. Had to be very firm with it. Looks pretty good right side out. So much more wearable now. Very happy to have finally done this. 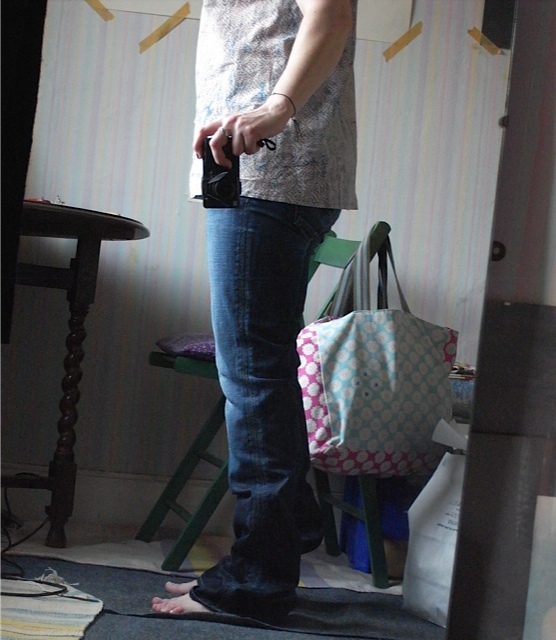 These have become my favourite jeans again. The perfect length for me now. How much equipment I’ve gathered over the last couple of years. Here’s a little run down of my most used items. Clockwise from the top. Janome 525s sewing machine, Obviously need a sewing machine. Tape measure, shears of which I have two pairs. The red pair are from Merchant & Mills , the grey pair, I can’t remember the make but I know they weren’t cheap, but for some reason they don’t cut nicely. They seem to have a nick in one of the blades and therefore I can’t do a nice long cut in any fabric as they stick. I think they were about £20ish, but the M&M pair were over £50 and well worth the money. Its so worth spending the extra pounds if you can afford too. I had some birthday money which is how I justified it. Then there’s the tiny black scissors, I love these. 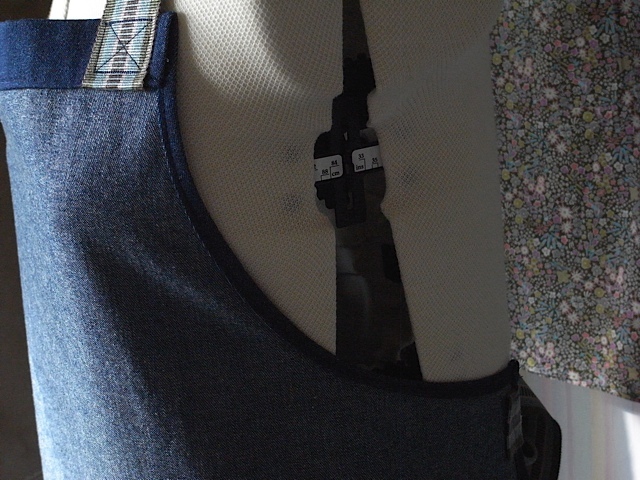 Endlessly useful and sit on my sewing machine to snip threads whenever I need them to, and you can get really close to the fabric so you can snip threads nice and close. It can be useful to have multiples of things. I have my ironing board down stairs so am often up and down stairs whilst making things and I find having a pair of scissors by the ironing board useful for snipping threads that I’ve forgotten to snip whilst upstairs. 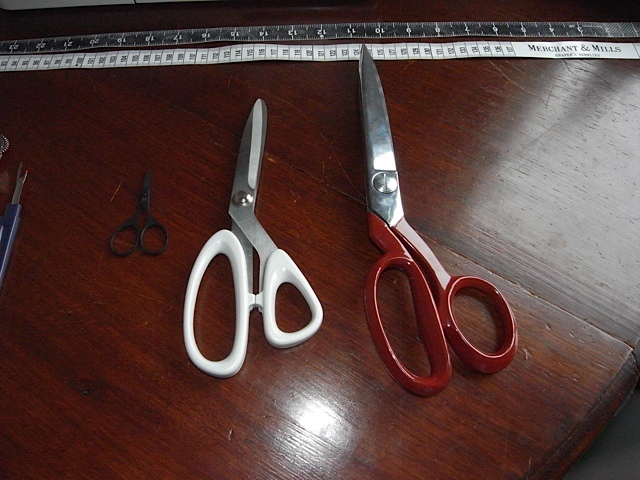 close up of the scissors/shears. Then there’s the seam ripper, or as I prefer to call it thread unpicker, I sometimes don’t feel like I’ve done a proper job till I’ve unpicked at least one seam. Tailors chalk, and this funny little gadget, can’t remember what its called, but you use it to create perforations in the fabric, with coloured carbon paper underneath to mark out darts and suchlike. Pins, I love the coloured plastic head ones. You can never have too many pins. And of course a pin cushion. I never ever thought I’d own so many ironing accessories, never ever thought I’d enjoy ironing so much. 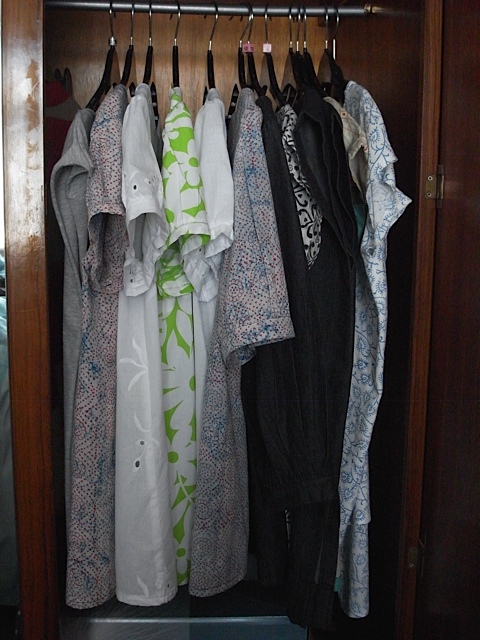 I call it creative ironing. Sleeve board, who knew you could get a little ironing board just for your sleeves. Love this though. Really makes a difference to your garments. Tailors ham, which I’ve yet to learn how to use properly. And the iron, this ones OK but I think I need a new one. The ironing board that they are all standing on was new last year. 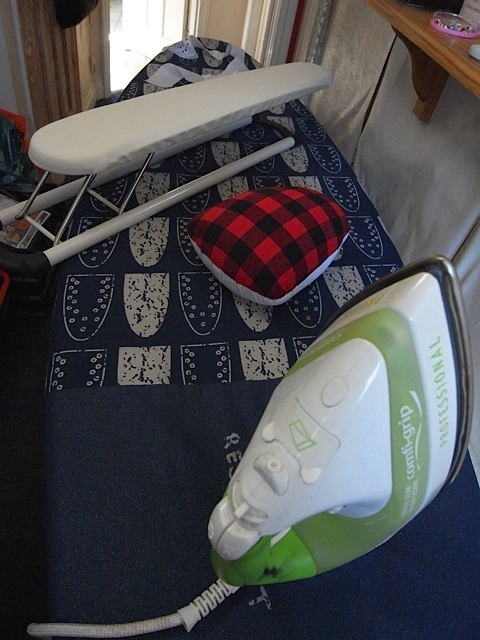 My old ironing board was about 100 years old and was really tired and sad. 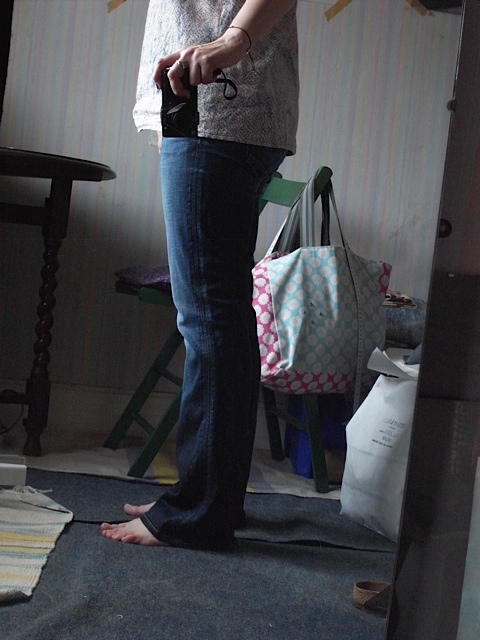 But until I started this sewing lark I didn’t iron anything if I could avoid it. My new one is huge compared to the old one. And often reminds me of a surf board. 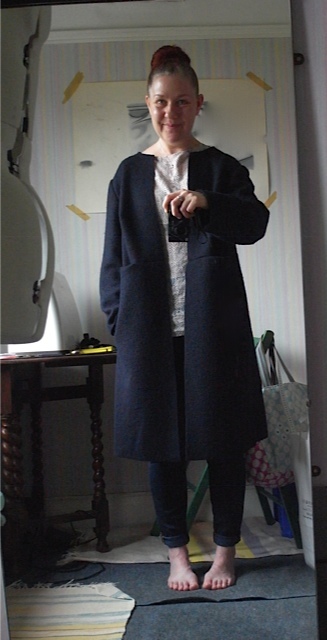 Its really long and quite wide too. And has lots of different height settings. And then last but not least is Gertie. 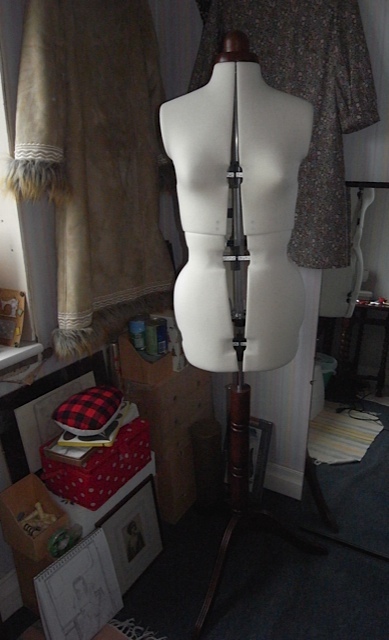 So so useful, I really urge you if you are thinking about a dressmakers dummy to get one. Though it is a little scary when you see what your figure apparently looks like! Especially from the side. 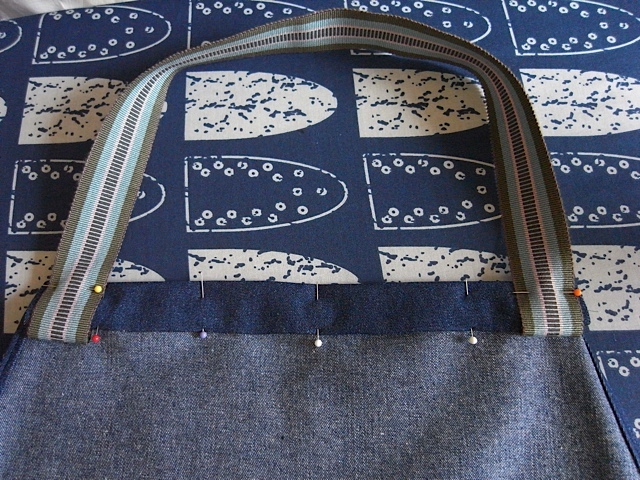 If you’re new to sewing I hope this has been a little bit useful. 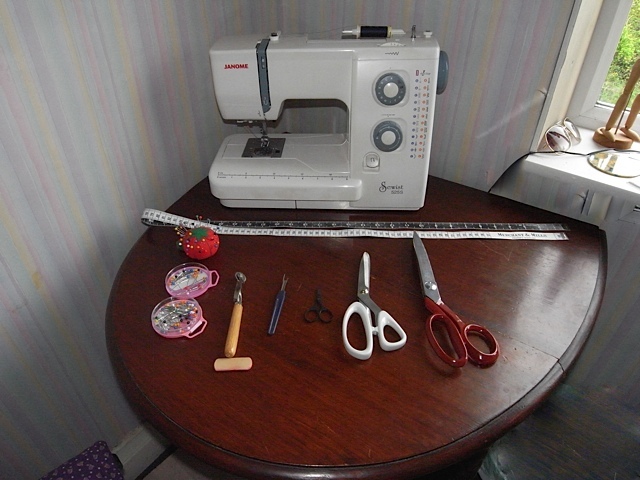 When I first started sewing I had no idea how much equipment I would need. Thankfully not all of it is expensive. 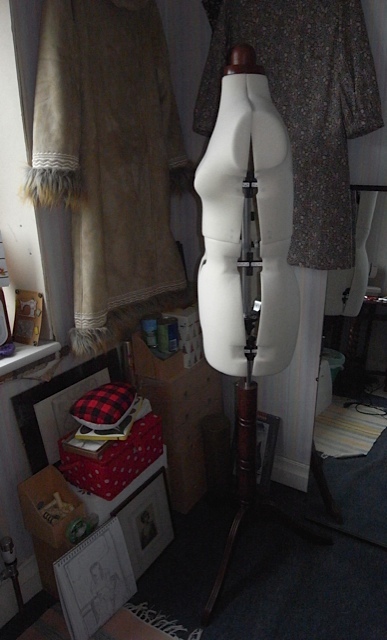 The biggest outlay should most likely be your sewing machine. 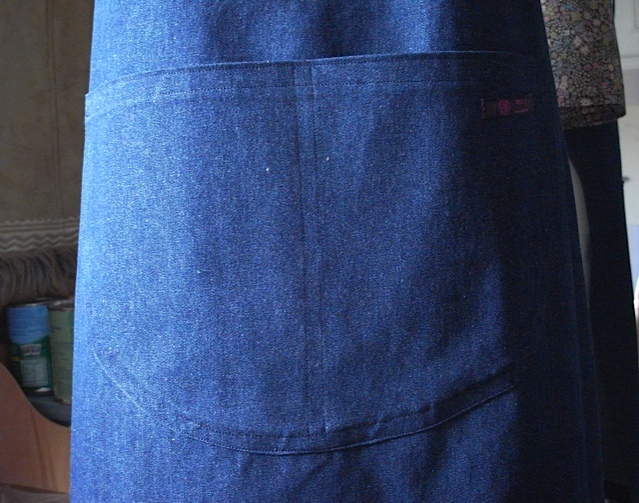 I don’t know about you but I can’t wash up or cook without wearing an apron, just doesn’t feel right to me. My old one was looking a bit sad and in need of a wash and I couldn’t find the other one with which to swap it. 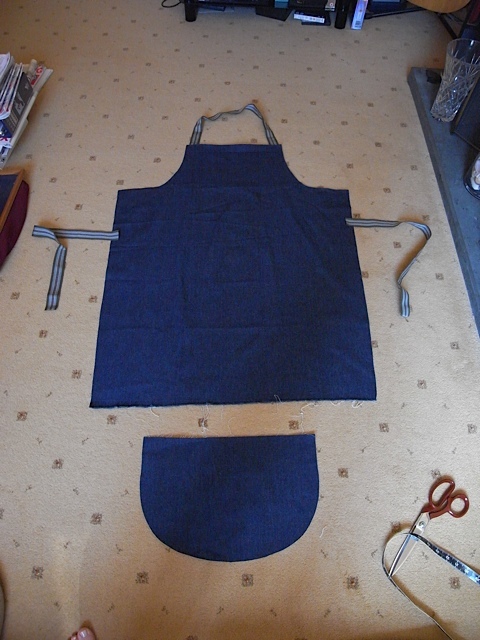 I’ve always wanted to make an apron as I love the shape and it looks like it should be easy. 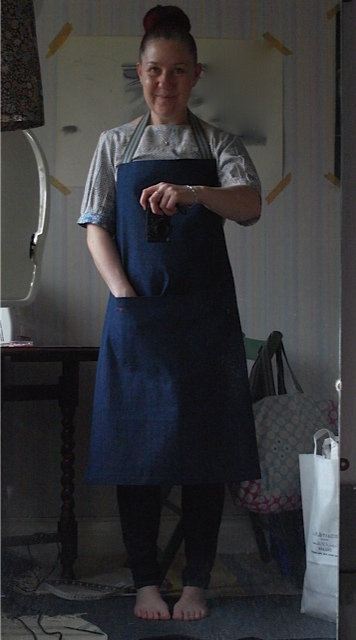 I remembered I had some denim fabric from Merchant & Mills left over from previous projects and wondered if I had enough to make an apron? 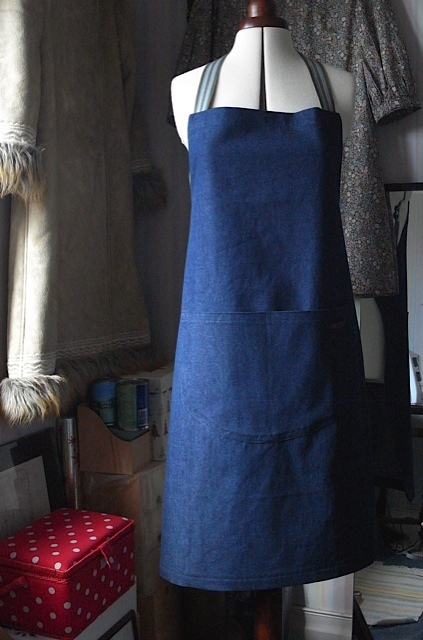 I had a look, laid the old apron on it and yes I had plenty. I even had enough for the ties. 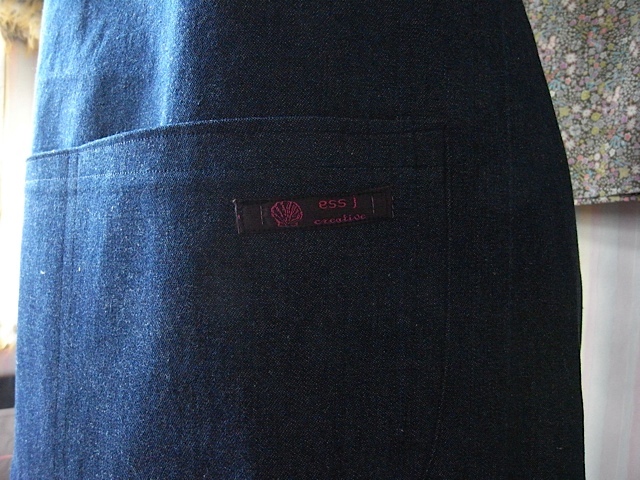 I was going to use a different fabric for the pocket, a light blue cotton canvas with dark blue stars, but decided against it. So I cut out the shape, cutting round the old one, remembering to leave plenty of room for seam allowances. 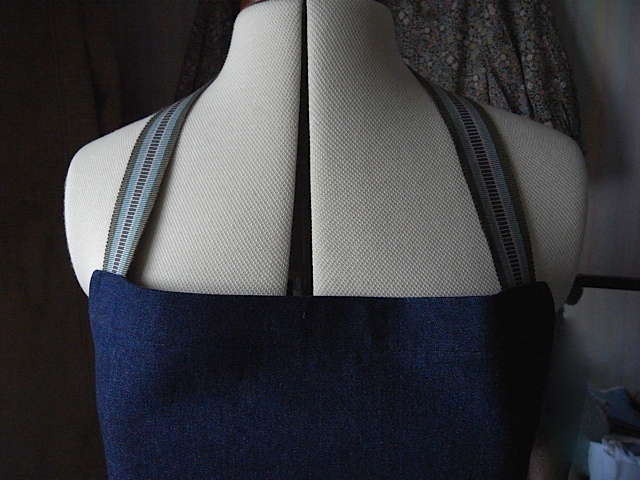 And cut out the neck and waist ties, after measuring carefully of course. 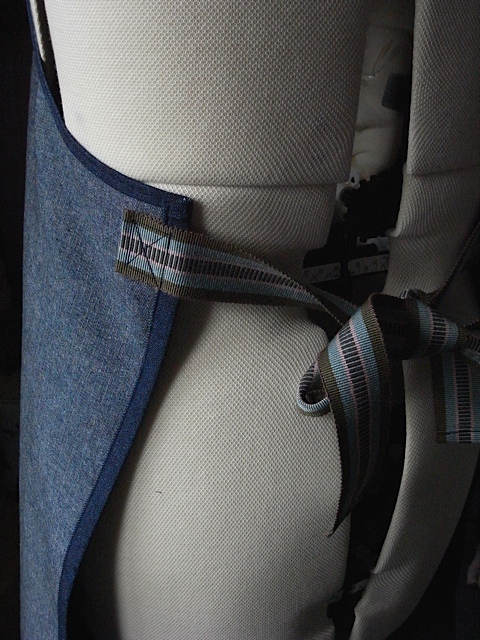 It was while I was thinking about the apron ties and neck strap and cutting them out that I realised there would be an awful lot of sewing to do with them, and again I remembered I had some gros grain strapping in my stash. I had a look and found the perfect match. Did I have enough though? It looked like I might not at first but after a bit of revaluation I had plenty. Oh happy day! I was a little bit anxious about doing the curve at the side but it went a lot smoother than I expected it too. 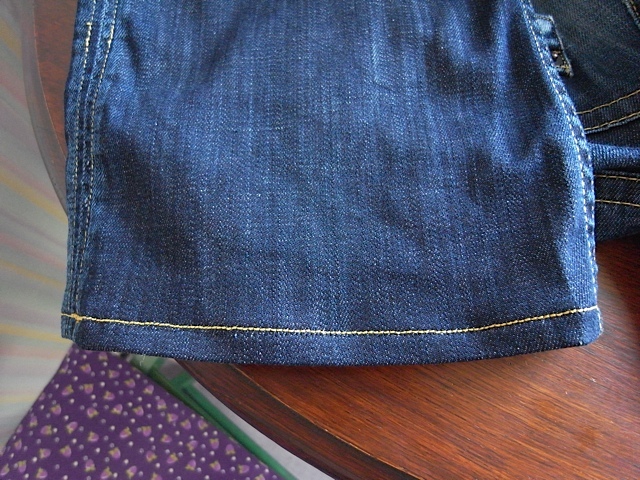 I first ironed the folded over edge and then folded it over again, ironed and pinned in place. Did the same the other side, sewed, and was happy with it. 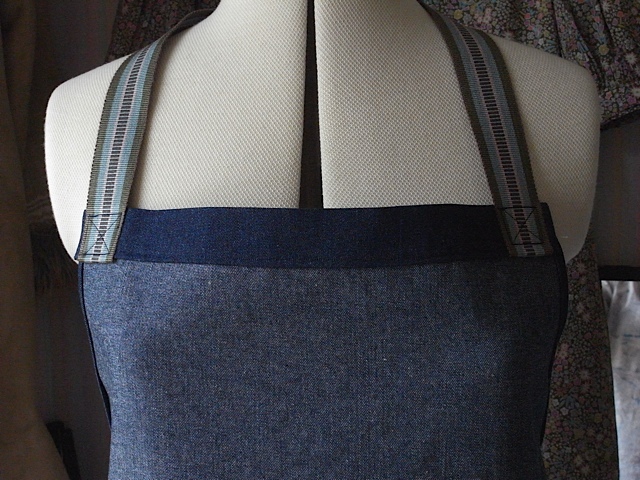 Next up was the top of the apron and neck straps. I had a good look at the old one to see how best to attach the neck strap. 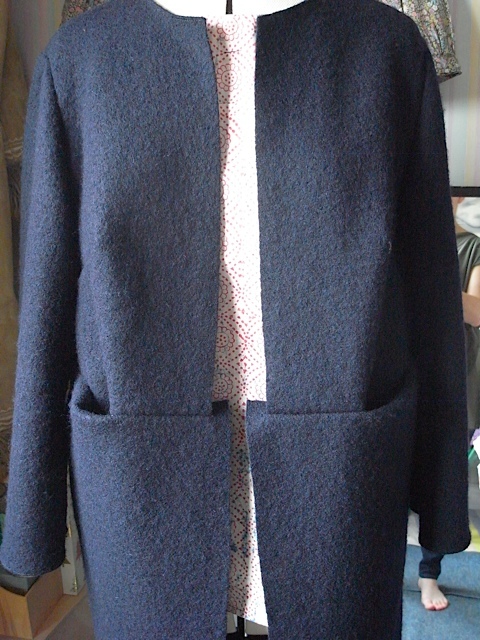 Tucked under folded over top, pinned in place, then sewn. 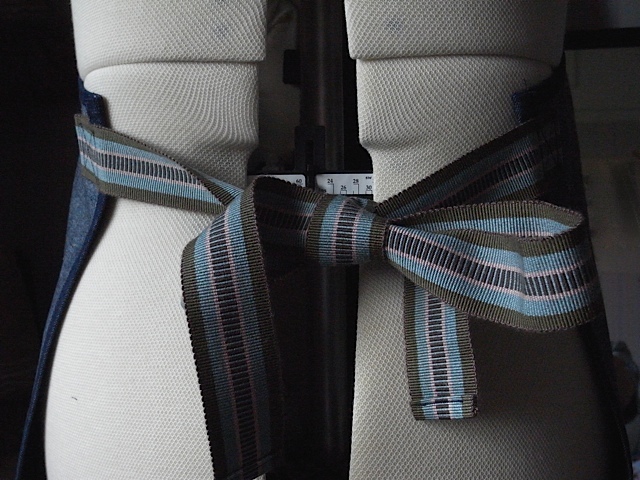 And then you turn the neck strap right way up and do some of that X shape in a square stitching. Think it might be called reinforced stitching or something. 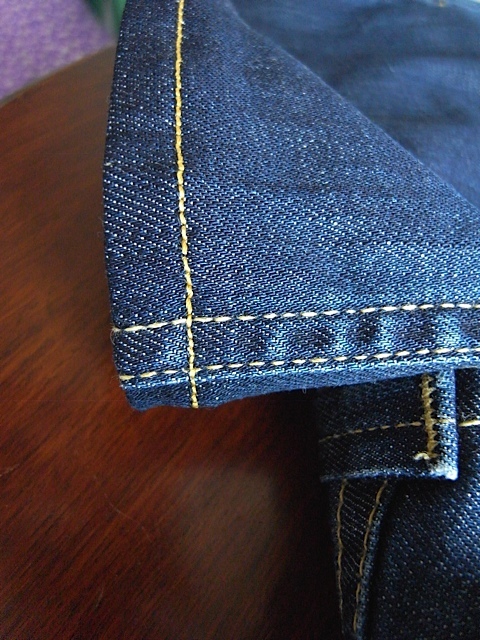 Then the side edges, again folded over, ironed then repeated. Sewn. Lovely. 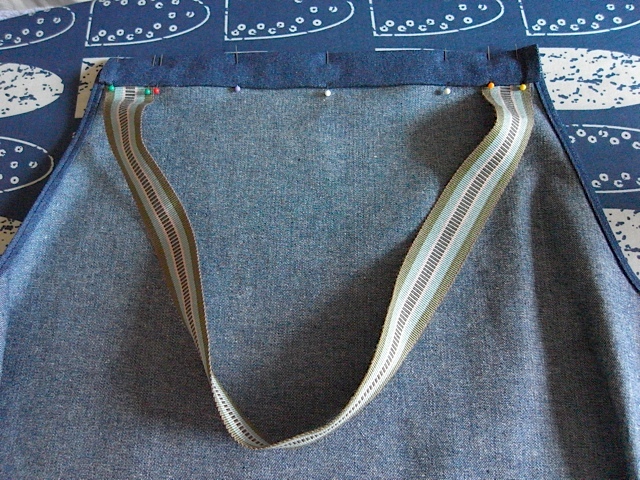 The waist ties were attached more or less the same as the neck strap. 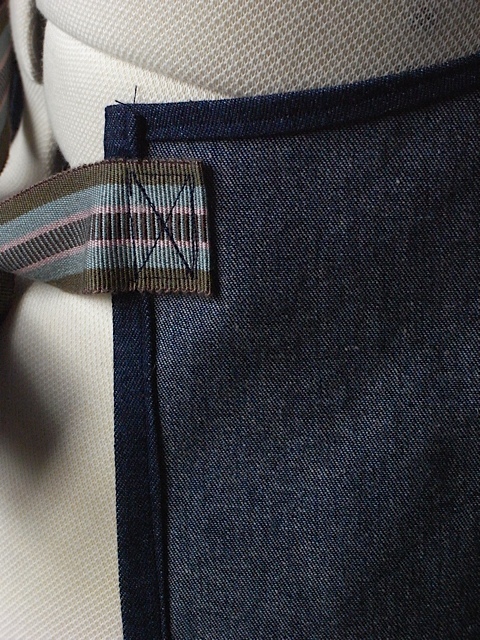 I found the pocket quite tricky. Folding the edge over it didn’t want to go nicely, so its ended up a little bit untidy. And my stitching isn’t brilliant either. Never mind though, apart from my husband, I’m the only one that’ll see it on a daily basis. Doesn’t look too bad in the picture. 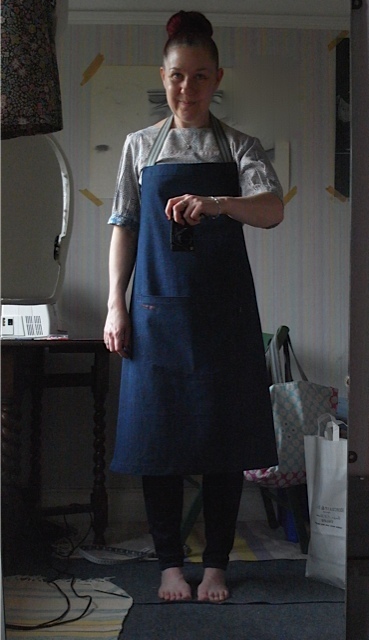 I know I probably shouldn’t be this excited about an apron, but I am. Makes a change from a blouse. 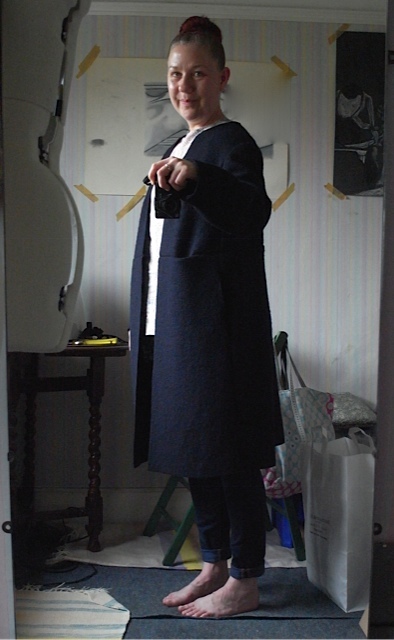 And cut off the excess 2cm from the bottom half of my Merchant & Mills Strand coat. Don’t know why I resisted, well I do really, I was scared I would completely ruin it, but I haven’t. I’m very happy with it now and wore it out today. 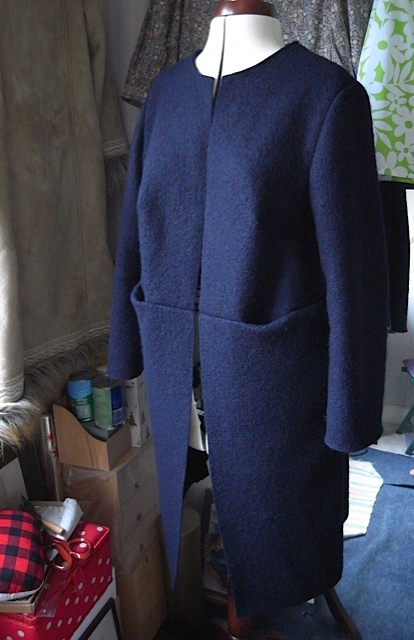 I’m now thinking I might get some hook and eye fastenings so I can do it up too. I had been thinking I would have to scrap this one and make another. 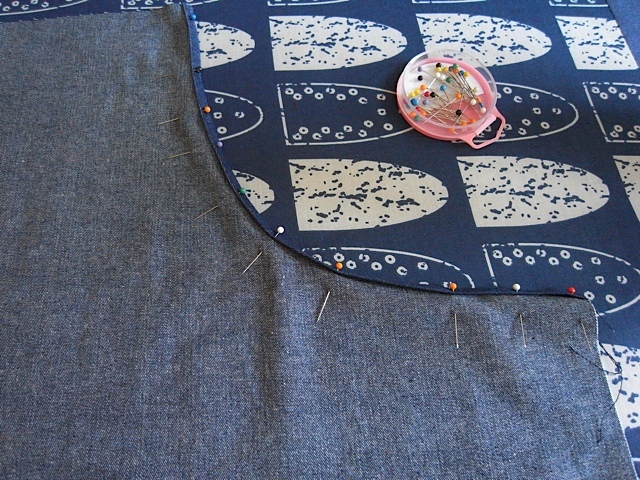 I had just about resigned myself to doing just that and was thinking about which fabric I would like to use this time. 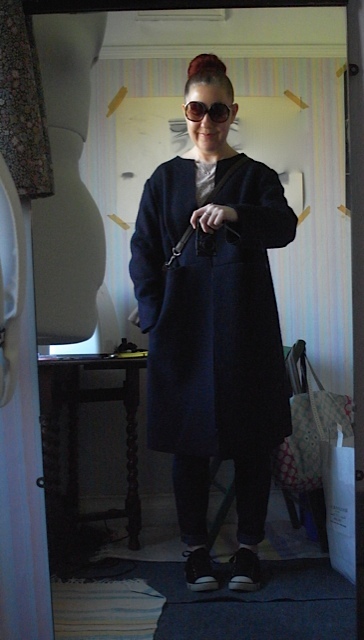 So I had a little look at the Merchant and Mills site and found they have sold out of the Strand coat pattern, I was also thinking I would have to buy another pattern as I had altered the one I have. 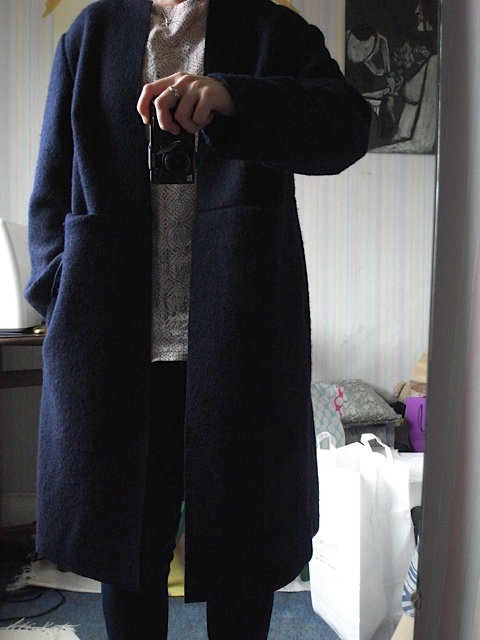 So when I saw they had sold out of the pattern I had another look at my coat this morning. 10 minutes later the deed was done. Should have done it weeks ago instead of trying to convince myself it was ok as it was. Doh!